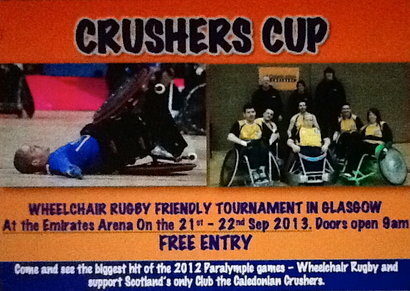 The Caledonian Crushers are hosting a “friendly” Wheelchair rugby tournament in Glasgow at the Emirates arena on the 21st-22nd Sep 2013. 6 Teams from across the UK and Ireland will compete across the two days for the new ‘Crushers Cup’. Entrance to the event is free and all are welcome…so please come down to the Emirates arena and support your local club.